So.. On the 6th of September, we have landed safely in Amsterdam. Home again after an amazing fieldwork. The trip from Greenland back to the Netherlands, with a nights stay in Copenhagen, was relatively tiring, maybe because of the tension release of all the excitement. From Amsterdam Schiphol Airport, I went directly to Utrecht University to put our samples in the cooling cell. In the coming months I will process the samples in the lab. I can not wait to see what secrets they will reveal about the changing of the growing season in the Arctic over the last couple of thousand years, in relation to present climate change. I will keep you updated on the further development of the project at some point in the future. In the mean while, feel free to contact me for information, to share ideas or to collaborate! I am very interested in your opinions and views. Because of storm at sea Friday, our boat from Disko Island to Ilulissat was delayed and replaced by a slow boat. Six hours of rocking and shaking on a rough sea took us to the Greenlandic mainland. I got seasick.. Because of the delay, we missed our flight from Ilullisat to Kangerlussuaq, so we needed to stay another day in Ilullisat. We booked a new flight to Ilulissat on Saturday evening. Saturday, late in the evening, we arrived in Kangerlussuaq. No taxies to be found to bring us to the K.I.S.S. science station. Fortunately, I knew that a friend of mine, Ingeborg, would be at K.I.S.S. for her research on airborne microbes. I called her and she was able to send a car, saving our day. Today, Sunday the 3th of September, we took some nice peat-cores near Kangerlussuaq. And after a nice hike up hill, we ended up on a meteorological/radio/satellite station which made the scenery look like something you would expect on Mars! Sampeling leaves from the herbarium of the Arktisk Station was a highlight of our tour. Famous for beeing the oldest scientiffic station of the Arctic, the Arktisk Station also has the oldest herbarium, with many plants sampled from even before 1906. The humbeling and unique oppertunety to sample from this famous collection was amazing. More scientiffic and populair attention needs to go to herbaria all over the world. The almost forgotten art of preserving and documenting plant samples for future generations of scientists needs to relive. Morten P. Porsild would have been proud. And we are very thankful. After several good field days with bad weather, we had our last field day at Disko. Today we visited Lyngmarksbugt and found the peat coring location we where looking for. About one meter of peaty sediment, with maybe 2000 years worth of climatic signals. While we where doing the drilling the weather changed from windy and rainy to sunny and nice, a beautiful scene. Later, on the way back to the Arktisk Station, a certain noise started to appear from the village. The noise of packs of howling wolves. The sledge dogs smelled the incomming fresh cold air from over the sea carrying snow, their ticket to action. If there actually will be snow this week needs to be seen, but the temperatures will drop soon. Slowely but surely, Winter is coming to Greenland. After 3 days of travel, we have finally arrived at the Arctic Station situated near Qeqertarsuaq on Disko Island. This station is the oldest research station in the Arctic, founded in 1906. For me, this is the first time in Greenland. I am amazed. The sheer beauty of the ice fjords, icebergs, autumn colours and snowy mountains is breath taking. Today we did a dwarf-birch sample session at the CENPERM seasonal warming experiments, near the station to kick off this fieldwork. In later posts I hope to keep you updated on our progression! Happily I share with you the fact that 99% of the logistical planning and preparations for our Greenland Campaign have been completed. Flights and ferries have been booked, accommodation reservations have been made. A day-to-day planning has been made and the equipment has been inspected. On Friday the 25th of August, myself and two other members of our team will fly from Amsterdam to Copenhagen. The next morning, we will meet up with the fourth member of our team. The team consists of myself, Rike, Wim and Daan. After the reunion of our team in Copenhagen, we will leave for Greenland. 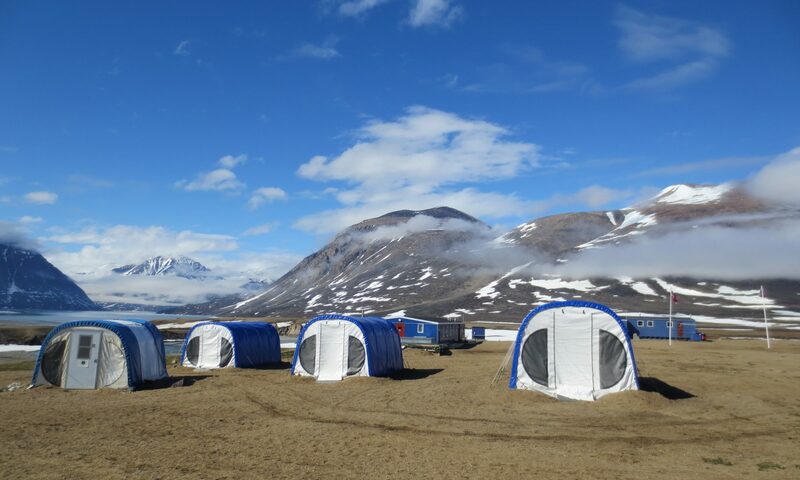 The Greenland Campaign will mainly consist of drilling and gathering sediment samples from small lakes and outcrops. In these sediments we expect to find sequential fossil leave remains, we are particulary interested remains of Betula nana or Dwarf Birch leaves. We hope that the oldest samples will be from at least a thousand years old. These leaves can tell us a lot about variations in the length of the growing season, temperature, and atmospheric CO2 through time. During our stay at Disko Island, we will also sample from experimental vegetation plots at the Arktisk Station (managed by University of Copenhagen). These experiments test the influence of factors like snow cover and permafrost on vegetation performance and interaction. Tuesday the 5th of September will be the day of our return to Europe, after 11 intense days in the field. Once back in the lab in Utrecht, we will analyze the (fossil) leave cuticles. The data from these analysis will help us understand arctic climate change and the consequences for the future of the Arctic. All the planning and taking care of things have made me extremely hyped to go on this campaign and I look forward to share my adventures with you in following blog posts!